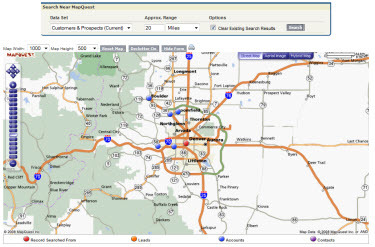 The recent release of Arrowpointe Maps introduced functionality to perform proximity searching within Salesforce.com. We call it �Search Nearby�. With the click of a button from a record in Salesforce, you can search for Leads, Accounts and/or Contacts that are within a user-specified proximity. Click the image below is see a demo of the functionality in action.